Last few weeks have been quite a whirlwind. I travelled to Punjab (Ludhiana) for my best friend’s wedding, with a stop-over in Delhi and then back home for some work. The onward journey to Ludhiana (by road) was nothing to talk about, except that we missed a turn on the way and reached Chandigarh by mistake. Then we caught-hold of a Sardar jee who blinked and gaped at us when we asked him ‘the route to Ludhiana’. That was a cue enough that we had lost the way. The Holy-highway of Punjab has no sign-board for Ludhiana practically ANYWHERE before Chandigarh, which, ideally should not be there on your way if you are going from Delhi. Who are these lunatics who install highway signboards, by the way? I have good piece of mind to give it to them. Rather, I don’t mind if they take my entire brain in lieu of installing correct sign-boards on all the highways across the country. We reached Ludhiana at about 10:30pm instead of 8:30pm and the plan to attend the engagement ceremony went kaput. The drive proved to be so taxing that we flopped on to the bed as soon as we reached and refused to recognize anyone who came knocking at our door. The highway trips are fun but owing to my last illness, I found it a little difficult to partake in the journey with all my enthusiasm and energy. Most of the events were routine tasks that are a part of north-indian wedding ceremony and nothing to glorify, really. 1) I found myself in the middle of a conversation that discussed the toilet-woes that one faces during trips/travel. I can’t say how the conversation started, but it closed at an eye-opening conclusion. I am doing a blog-post on it and you should be able to read it soon. 2) On the way from Ludhiana to Delhi, I took a video coach. As soon as the journey started, they played a Punjabi movie called Singh Vs Kaur. Even though I was least interested in it initially, as i thought I would not understand the language, I watched the movie. What surprised me was the fact that I understood it and the dialogues from the word “Go”! The movie was hilarious, brainless and fun. Once this movie was over, they played Aashiqui 2. I have no idea what revenge the makers of Aashiqui 2 had in their mind when they made the movie, but it was a torture of the highest order! a) Was very happy to know that the State Transport department has taken heed to my email to them and the buses are no longer taking their journey-break at Bikanerwala, which insisted on burning a hole in everybody’s pocket with its measly quantities. Instead, it stopped at a ‘dhaaba’ called ‘Tadka’ which does amazing arhar daal and tandoori roti. I just wish that they start doing tawa-roti(s) real soon. What good are highway-journeys without a ‘dhaaba‘-break, anyway? 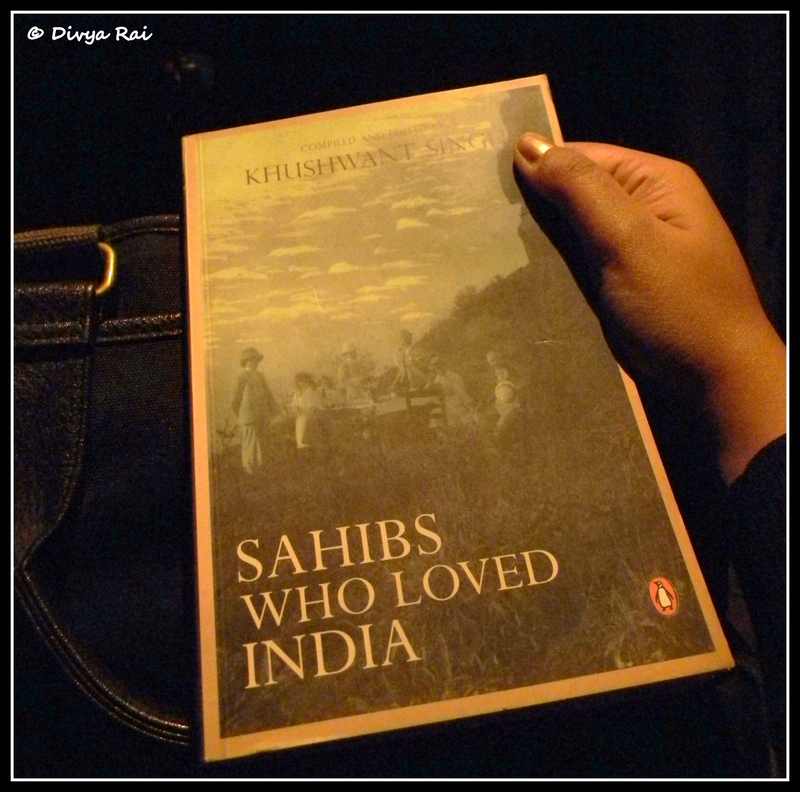 b) I chanced upon a book by Khushwant Singh, called ‘Sahibs Who Loved India’. I am not a history-buff at all, but the format of the book seemed quite inviting to read. The book proved to be quite effortless too. In fact, this is the first time ever that I am taking notes while reading a book, but that is purely for my own knowledge . One can read the book without any such pursuits too. Stay-tuned! My backpack is spilling over with amazing stories.